Not as huge and opulent as the two other protagonists the Romantik Hotel Sackmann is located in Baiersbronn-Schwarzenberg soon after one arrives in Baiersbronn itself. The hotel is owned by the Sackmann family and has been recently enlarged by nice modern SPA facilities. The gourmet restaurant Schlossberg is one of three restaurants being served out of one kitchen which is noteworthy as the number of couverts is quite high if the ALC restaurant Anitastube and the hotel restaurant Silberstube are fully booked. Hard to ensure a consistent quality for a one star and 18 points restaurant under these conditions! Jörg Sackmann did his apprenticeship as a cook at Wohlfahrt’s Schwarzwaldstube and worked under Albert Kellner in Baden-Baden and Eckart Witzigmann at the Aubergine. One could say that Witzigmann was an important stint but Sackmann stayed there only two years and then took over at the family hotel after having passed the kitchen master exam in 1988. In 1993 the Schlossberg was opened. Sackmann independently developed an unique style which you will witness hereafter. Basically there are three menus which in effect are only two and the “Culinary Discovery” is merely a combination of the two others. Well, at least that is what our waiter told us. After I opted for the large discovery he wrote down the larger one of the two and inserted two desserts and a savory course. I sought clarification and was told that the discovery is only an enlarged version of the larger menu. Somehow confusing I thought and ordered a second savory course to be inserted and that I do not want to have three dessert courses plus cheese but only one. Anyway, the service over the whole night was ambitious, unpretentiously funny from time to time but always symbadisch (nice wordplay for symphatic;-)). The discovery is a nine course menu (with the mentioned cheese from the board and three (!) desserts) for €135. We set out with three amuse which were quite modern for a real Black Forest Setting. Scallops with granny smith and eggplant cubes was fresh and earthy/salty at the same time whereas a lime foam bound the components together. Unfortunately the scallops were sliced too little and did not stand out against the strong flavours of the other protagonists. Good. 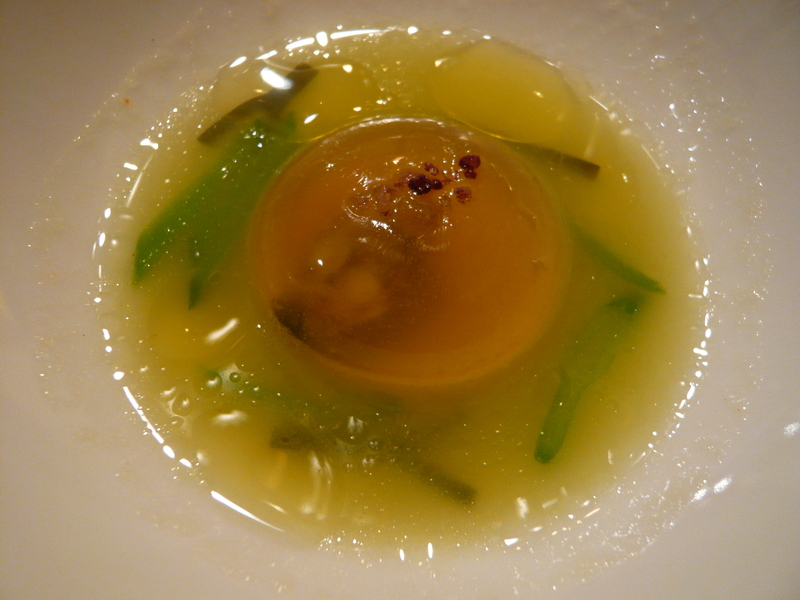 Packaging a vongola verrace inside a sphere with its own juice is a good solution of condensing flavours – unfortunately I had just eaten a similar amuse at Can Roca which was naturally better in terms of product quality. Nice fit with the celery and algae. Strong and fresh flavours. Very good. The first part of the real menue: sandwich of gingerbread with foie gras and mango. I like the pairing of gingerbread and foie a lot as the sweetness of the foie and the rustic and slightly spicy nature of the gingerbread work very well, if, yes, if, the proportions are done right. The impression that it is hard to detect the foie on the picture so not wrong – as the gingerbread was too thick and too large it completely dominated everything else. And, I have no memory of any mango taste. Here, Sackman is too complicated – serving the gingerbread in textures or only slightly flavouring the foie with it would have been more rewarding. I still remember Helmut Thieltges very Christmas-like interpretation of foie where he had the specific aromas of cinnamon etc to just kiss the foie. Next up was white halibut with Bigorneaux, confit, sauce epices and onion gnocchi. Back on track though a very classic dish – I especially liked the combination of fresh mussels, earthy onion and the confit of onions – an enriched orchestration of Mediterranean flavours. Very good. Then the dish of the night: Sockeye salmon in eucalyptus crust with Jaroma cabbage and barbarry-potatoe jus. It is presented within the crust which looks like a kitchen disaster as the crust is completely black as if it would have been in the oven much much too long (unfortunately I don’t have a picture:-(). The wild salmon was cooked to perfection and admittedly one of the top three salmon dishes of my life. However, the eucalyptus aroma did not come through that much which on the other hand was good. Chanterelles, the mild Jaroma cabbage (also called Turkish cabbage) and the nice sugo made this an excellent dish. The intensity and the rustic nature of the flavours increased as Sackman served gratinated black salsify with wineyard snails, marrow dumplings served in a Pelatello jus. Theoretically this would have been exactly my taste. I like snails as they remind me of my childhood and my first encounters with “Gourmet” products when the snails were served in a pan topped with herb butter with lots of garlic. The black salsify was too al dente (almost like eating a raw one) which was a bit detrimental, but overall it was yummy and good. The main course wild duck breast with purple curry was the least appealing dish of the evening as the breast was of poor quality, overcooked and the purple curry did not make sense at all as it throned on the breast like an order not picked up. What a difference to Amador’s pigeon with purple curry. Jörg Sackmann plays a risky game – his creations are pushing the frontier but to make the individual dishes and the whole dining experience excellent (worth two stars) it would require Sackmann’s full dedication on the Gourmet restaurant – as he serves three restaurants out of one kitchen the shown quality and creativity is very good which is one star overall. The more I think about it the more I have the impression that he wants too much and puts too many ideas in just one dish. Still, as this was even more pronounced in earlier visits. Less is more! Would I recommend it to go there? Hm, hard to say on a stand-alone basis but I think together with Wohlfahrt and Lumpp it is a nice counterpoint to the more traditionally oriented chefs in Baiersbronn. And, on a good day he has the potential to be really close to their standards, but more interesting and more creative. But, it can be very well a roller-coaster ride like on this very evening. In the end, it is again a good example how German chefs have emancipated themselves from the French influence and show a quite distinct style. This entry was posted in Europe, Germany - Fine Dining and tagged Baiersbronn, Black Forest, Germany, Jörg Sackmann, One Star Michelin, Schlossberg by IFS. Bookmark the permalink.